This post brought to you by Rambler's Way Farm. All opinions are 100% mine. It's my favorite time of year. Fall. There's nothing I love more in my wardrobe then my jeans and comfy wool sweaters. Hailing from Michigan, I have quite the sweater collection, living in Virginia, I rarely have use for most of it. Nothing says cozy better than wool. Rambler's Way has come out with a line of next-to-skin baselayers that would provide me with the comfort of wool that is still cool enough for the warmer climate I now reside in. This very versatile scoop neck Tee would be great under a flannel shirt for cooler temps. I also would love this camisole along with a pair of their Long Janes to wear around the house and to sleep in. They also have underwear. Regular and low rise briefs to keep your middle parts warm. I'm undecided on these. I think they may prove beneficial to avid Football fans who spend hours sitting on cold bleachers. The thought of wool on my girl parts seems luxurious and a little odd. I'm an adventurous gal, though, so I would have to try them. There are several benefits to these wool baselayers. Made from 18.5 micron wool, these garments are made to keep you warm or cool depending on the weather. Wool fiber repels moisture and odor and allows for several wears before washing. This particular wool is machine washable due to enzyme-treatments that prevent them from shrinking. Washable wool. I'm in love. What's your favorite cold weather material? What clothes do you get excited about when the weather starts changing? You get to a point in your mothering career where you actually get the results of your "experiments". I can't think of a better way to put that. We are inundated with advice from our relatives, friends with kids and complete strangers. We have to decide what's right for our family. I did a lot of reading while pregnant with my first child and continue to educate myself on different ideas and parenting styles. In the end, I make the decision that I feel will work best for us. So far, so good. There is a lot of debate on sleeping. How to put your kids to bed, the benefits and risks of co-sleeping, setting consistent routines, all pointing to which is best to avoid sleep issues and allow the best sleep for the children. It's a lot of information. I've wondered if my choices would negatively impact our children. I've found out recently that it's not as big a deal as it's made out to be...at least not in our case. I did not consciously set out to co-sleep. We bought the crib, outfitted the nursery and waited for the arrival of our son. Once I laid eyes on him I didn't want him out of my sight. I slept with him on our couch for the first 3 months, using the excuse that it was easier to nurse in the middle of the night and didn't require getting up to retrieve the baby. When I went back to work, and worked 50 hours+ a week, having him next to me at night became even more important. We moved upstairs to the bed and he stayed there until he was 2.5. We moved him to a toddler bed to make room for the new baby that would soon be coming. He had had the toddler bed for over a year but we were slow in getting around to using it. When we did, Hubster or I would lay with him until he was sound asleep, one of those things your warned against as a new parent. "It's important for children to learn to fall asleep by themselves." I figured there was plenty of time for that. Along came Puddin Pop and the 3 months on the couch returned. Looking back, I was keeping her (and him) all to myself. I didn't want to share that precious snuggle time. After 3 months we again bypassed the crib and took her straight to our bed. I love the feel of my children snuggled up next to me. I feel safe knowing I can check on them throughout the night and I am right there making them feel safe. When Hubster is out of town I bring both kids into bed with me and love having them there throughout the night. Fast forward to a couple months ago. Puddin Pop has had her own twin bed since she was 18 months old (Handsome moved to a double just before his sister was born) she just recently (at age 4) has started sleeping in it regularly. At the beginning of summer we instructed the kids that we would try over the summer to get them to sleep on their own. We were hit and (mostly) miss on this one. Knowing you're giving up that snuggle time makes you want it even more. That's my feeling. At the end of summer we spent a week in Nags Head with another family. Handsome, PP and Sasha (not her real name) all shared a room with bunk beds. They did an excellent job going to bed on their own and we figured, once back home, it was the perfect time to put our plan into action. The kids are now 4 and 7. They have never had a structured bed time routine. They have never gone to sleep without a parent there to snuggle with them until they dosed off. They often fought over which parent was going to "go to bed" with them. We proposed, in honor of a new school year and the fact that PP would be starting school as well, that we stagger the bed times. PP would go up at 8:00, brush her teeth and we'd read to her until 8:30. Baths are done earlier on nights they happen. 8:30. Lights out. Kiss from Mommy and Daddy and off to sleep you go. While the good night wishes are being doled out, Handsome brushes his teeth and then one of us lays with him until 9:00. We enjoy the pleasure of having him to read to us during this time. 9:00. Lights out. Kisses from Mom and Dad. Off to sleep you go. That's what we proposed. It hasn't been an issue. We didn't "break" them by laying with them all these years. They are fully capable of going to sleep on their own and stay asleep through the night even though we refused to let them "cry it out" when they were babies. It was only a theory in the beginning and it may not work for other people but we are totally happy with the outcome. Proud of our children and ourselves for trusting our judgements. Thrilled we've had all this time to snuggle and sleep with them and happy the "experiment" worked in our favor. Do you ever watch a program and think "I would so be friends with that person?" I know, mostly we're drooling over the attractive men we watch in movies but really, which women, or characters, would you love to hang out with? I'd love to hang out with New Christine. Julia Louise Dreyfus is funny, charming and speaks her mind inappropriately. She would be the first person I'd pick to take to a PTA function. While they can seem a little intimidating, having a friend like Christine to connect with and test the waters to figure out which Moms are the right ones to associate with. I love the differences in all my friends and people in general. I think Christine finds her way through lots and lots of error. She can't help but make everyone else look "put together." After, we would share a bottle of wine and spill all we learned. She has found the perfect relationship with her ex for the benefit of their son. So much in fact that he sometimes is assumed to be with the other and gets forgotten all together. That was a fear of mine before the kids were born. I now realize that I would recognize the silence and know something was wrong. Tune in to "The New Adventures of Old Christine" 5 days a week! Check out here to find your local show times. Then tell me I'm wrong about wanting to be friends with her...Barb too. Which friend do you want by your side during awkward moments? I have been hired by Warner Bros WBWord division to raise awareness for 'The New Adventures of Old Christine. Go to Diamondearrings.org. Mention their site anywhere on the web. Facebook, Twitter, and Myspace all count. Pay just the shipping and handling ($3.77) and they will ship you beauties like this anywhere in the US. It's a special, limited time only deal. They are trying to get their site name out there before launching an ecommerce store. How about a "Reuse" challenge? We recycle. We could be doing more. We are fortunate to live in a city that not only provides the recycle bin but also has twice a month pick up...right at the curb. I believe they charge a fine if the container isn't put out 3 consecutive times (6 weeks). With the city behind helping the environment how could we not recycle? There's still more that can be done, though. Aladdin, makers of reusable products, is challenging all of us to Do The Reuse Challenge. To stop buying coffee and taking it from home in reusable, insulated cups. To also take cold water instead of buying bottles throughout the day. To take our lunch in reusable containers to work instead of purchasing or packaging in bags. 50 billion disposable bottles of water are consumed each year in the United States. That's 137,000 each day. Making coffee at home instead of purchasing it each morning could save an individual more than $500 a year, depending on where it is purchased . It is estimated that at the current rate over 23 billion paper cups will be deposited into our landfills in 2010. Aladdin will be following 9 families that have already accepted the challenge. The families are blogging about the impact their reusing is having on their lives and their finances. You can follow Aladdin on Facebook to keep up with the families and share your own stories...if you choose to accept the challenge. I want someone who get's me! I want someone who comes home at the end of the day and thinks the decisions I've made are right. I want some one who can agree to disagree and we can learn from each others thoughts. I am strong willed and self serving. I love my children more than life. I want someone who acknowledges that and agrees to be my partner through it all. Kids first! Tuesdays are for Random. My weekly therapeutic rant about everything. Little tidbits of stuff going on and thoughts in my head. Everyone does it. Some of us save it for Tuesdays. If you want to join us, or just take a peek at who else is playing...head over to The Un Mom. She's the Queen of Random and the rest of us just try to be as random. I had my theme hijacked. You probably noticed. Someone sent me an e-mail message and when I took a look the entire thing was covered with "photobucket image no longer available." I guess the free theme was no longer desirable to the designer and they deleted the whole thing. I quickly grabbed a free one from blogger and put it back together as best I could. Still need to do some work, though. We've had parties the past two Saturdays for the kids and their friends. First we had a HexBug Nano party. All the kids received nano bugs and spent hours building tracks to run them on. I think the dads had more fun building the tracks, but it might just be me. The second was a Star Wars: The Clone Wars party. Action Figures for all and the Season 3 Premiere. Popcorn, licorice, cookies and Yoda Soda. Lots of running around and light saber battles. This Saturday I'm going to chill. I've earned it. 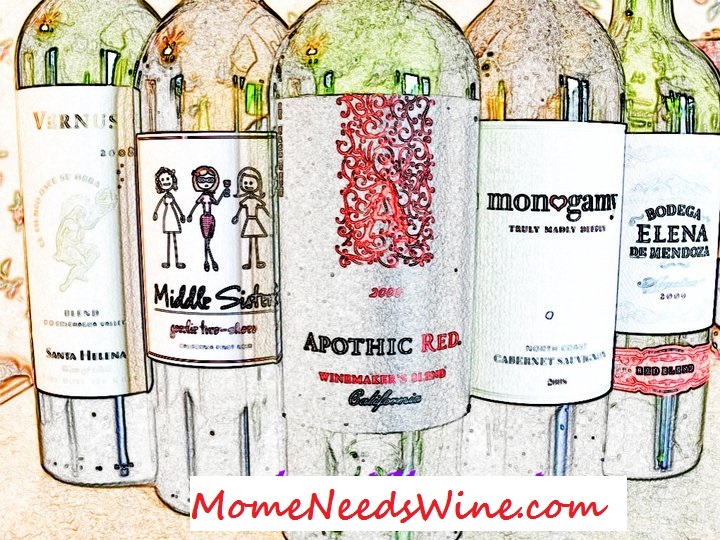 I was invited to a Bloggers Virtual Wine Tasting in October. It's a two hour event presented by a Master Sommelier and 8 winemakers from Chile. I'm excited to participate and even more excited to be receiving recipes to pair with the wines. It should be a good time of food and wine. I posted on FB that my boss never works on Sundays and we just slack and goof off in his absence. First off, it was a joke. I was responding to a comment his wife made, we're friends. I never goof off. Just wanted to clarify that for any future employers. As it turned out, the boss was there creating a massive project for me when I arrived. I laughed and asked if he had seen my post. He hadn't. He's rarely on FB. I told him what I had written and he said "then this should make the blog." It did. Just a couple more weeks and Puddin Pop will be in preschool. 5 days a week. Every morning free. I'm getting excited with all the things I want to do. How much will I actually get done? We'll have to wait and see. That's it for me. Now go and read some more random. TV is my guilty pleasure. I don't watch much while the kids are awake but once they go to bed I like to lose myself in a good drama or reality series. Usually it's one that was recorded days (and sometimes weeks) earlier. I think I just heard that this is the farewell season or week or something for As the World Turns? Is that right? I thought about recording the final episodes but it's been so long since I watched I figure it would take me the whole time just to catch up. I did watch seasons 1-5 of Grey's Anatomy over the summer on Lifetime. With season 7 about to begin I almost bought season 6 on Amazon but never got around to it. Just on a gut feeling I checked Lifetime today and Voila...season 6 started. Two episodes a day...five days a week. I'll be ready to start watching season seven in a couple weeks. I've reclaimed my living room and claimed it a kid free zone in the afternoon. I've been watching some old sitcoms on and off while making dinner. Things like King of Queens and Seinfeld. I was very excited to see that The New Adventures of Old Christine has joined the Lifetime afternoon lineup. I love the true-to-life storyline. Christine is quirky, fun, scatterbrained (what mom isn't) and adjusting to life as a single parent and dating. I love the relationship she has with her ex and think a lot of people wish they had it that good. It's an over the top look at all the mistakes we make as parents, working women, and trying to accomplish it all. Even on a bad day I've never "lost" a kid or forgotten to pick them up from school. It's refreshing to watch someone who makes more mistakes and still takes them with a grain of salt and moves on. If you haven't seen the show yet, now is the time to get caught up. I guarantee you'll relate and laugh and it's a nice way to break up the day. Give yourself a break and enjoy an episode or all of them. DVR's were made for a reason. Tune in to "The New Adventures of Old Christine" 5 days a week! Check out here to find your local show times. We're having a Star Wars: The Clone Wars Party today and the kids have done a fabulous helping to get ready. They picked up their rooms and the den without fuss and are now just anxiously waiting for their friends to arrive. We are celebrating the third season premiere of the show, which aired last night. We have cookies, popcorn, gumdrops and Yoda Soda for our guests to much on during the movie. We also have action figures to give away (Thank You House Party) and games to play. Last week we had our HexBug Nano party and everyone had a really good time. I've enjoyed spending my Saturdays getting ready for the kids to entertain friends. I'm thinking of doing a monthly party to break up the monotony of the school week. The kids enjoy having all their friends together and it's nice to have a house full with other adults to chat with. Now I just need to come up with something for the next one. Education has changed a bit since I was in school. There is a big emphasis on giving kids a head start and they jump right in...in Kindergarten. When I was in Kindergarten, it was half day, we took a nap (or at least had quiet time and a rug we laid on). We spent most of our time learning to adjust to sharing attention, toys and art supplies. Nowadays, counting, skip counting, counting money, phonics and reading are very important in advancing to the next grade. By first grade, Science and Social Studies become part of the curriculum and students are actually tested on these subjects along with Math, Spelling and Comprehension. I was pleasantly surprised last year when Handsome's teacher told me he excelled in Science and Social Studies. He also seemed quite interested in learning different facts about different species and was often heard quoting facts about Polar bears and spiders to Puddin Pop. He has a brilliant memory. We've always gotten a good chuckle when he sees a commercial on TV for a product he's sure we need. He recites it almost verbatim and follows up with "Wouldn't that be great to have?" or "Wouldn't your life be easier if you had one of those?" He definitely could make it as a salesman, but we currently have higher aspirations for him. With his interest in Science, we purchased several ScienceWiz kits that have all types of hands-on experiments as well as booklets explaining how things like Energy and Light work. We had a lot of fun with these over the summer. Making learning fun always generates the best results. Know Magazine is another great tool for the Science enthusiast. Developed by the publishers of Yes magazine, Know is geared towards the 6-9 age group. They feature real scientists, new technology, interesting facts, do-it-yourself experiments and much more. With beautiful, eye-catching images and easy to read print, this magazine is sure to provide hours of fun-while-learning for any child. It may even be a good way to get a child that isn't all that interested in Science to open their mind to all that science encompasses, sparking a new interest. Know magazine is free of outside advertising so your child can stay focused on the material. I find this refreshing and comforting. I can't wait for our first issue to arrive. I look forward to learning some new facts (which I'm sure I will) and watching the excitement in Handsome as he learns more about the fascinating world of Science. This year I decided to do my part, not only help Handsome study but, to pay particular attention to the subjects he seems most interested in and provide him the tools to excel and stay interested. Reading was a chore last year. He never wanted to read. Although he was in the top reading group in his class, he insisted we read books to him at night. Easy Readers like Dr. Seuss brought about anxiety if we asked him to read. Best I could do was to offer reading every other page with him. At the end of last year he got interested in the Diary of a Wimpy kid series. We watched the movie as soon as it hit OnDemand and he's been asking for the Movie Diary book ever since. I did him one better. I ordered him the entire series, including the new one that will be released November 9th. Each night we go up at 8:30 to brush our teeth, he then reads to me (or Hubster) until his bedtime at 9. His gained confidence from last year is impressive and having something he is interested in reading has made all the difference in the world. How do you inspire and promote a love of learning in your home? While I am very social by nature and LOVE my online social activities and friends, I have yet to take it to the next level. I do not own a Blackberry or smart phone. I've stood firm by my decision that my cell is for emergencies only. Very few people have my number and I mainly carry it so that the people responsible for the kids (grandparents, school personnel and friends) when I'm not with them can contact me in the event of an emergency. I usually forget it has a camera and knock myself in the head for not taking pictures. I did add the ability to text to Facebook while doing the Relay for Life as I wanted to share the experience with my friends. I still use that power from time to time. Recently I joined Foursquare and thought it would be fun to update all the fun places we go. First I was getting messages that my phone was not set up for premium texting. I fixed that only to realize that I didn't have a data package so I had no way to update. I really want to play. I really need to upgrade. In looking into options I came across Boost Mobile. They have a variety of plans that allow you to customize to your needs. They are VERY affordable and best of all...the are a NO-contract company. We have been with another carrier for a number of years and have been mostly satisfied. It seems, though, that every time we make any changes we are automatically signed up for another two years. It would be nice to be able to have options, especially when other companies are offering better deals. With Re-Boost (their payment options) you can set up recurring payments, find a store to pay in person, or pay by phone. You can also add money to someone else's account without attaching the card information for future payments. This would be a good reward system for a child with a cell phone who may be responsible for payment. Extra money for good grades or helping extra around the house could earn money towards their bill. While my kids are still a little too young to be carrying cell phones, I can see this being an added incentive in the future. The ability to update Facebook and twitter without worrying about going over my text limit is very appealing. Boost offers unlimited talk, text, web and e-mail for just $50 a month ($60 for blackberries). They also have a $2-a-day option, which again may be useful on a family plan to limit use for younger kids who wouldn't need a phone all the time but may find it useful when away from home. Do you update your social networks while away from home? How important is "staying connected" to you? I'm ready for this summer cold to be gone. It's been lingering for far too long and I'm over it. With any cold I get, long after visible symptoms are gone I get a lingering night time cough that keeps me up for hours on end. Last night I had the genius idea to put cough drops in my tea. The cough drops did wonders, the tea kept me up past 2am. Tonight I'm going to boil water and just add the cough drops. Hopefully I'll get more sleep. Handsome has completed his first week of 2nd grade and seems to be adjusting well. This is the year they start letter grades and he scored an A on his first spelling test on Friday. Poor kid doesn't realize how high he just set the bar for himself. We're going to do everything to keep seeing more grades like that. Since Puddin Pop will be starting at her Montessori school soon and it's a little more than we were expecting to pay, I've offered my services at my part time job and requested extra shifts when they are available. I'm now working today and Friday (I usually just work Sundays). I have mixed feelings about this. Work is not an issue. I really like all the people I work with and since it's a place that mostly men shop at, there's rarely any drama. It just throws me off my game. Handsome will get home before I do (and wait at the neighbors) and PP will be at work with Daddy at Grandma's house. Who knows when they will be home so it'll be a crap shoot on whether I'm cooking dinner for 2, 3, or 4. I'll adjust. If you found out your MIL was shopping around for pre-schools for your child, without ever mentioning it to you, how would that make you feel? What's going on with American Idol? Jennifer Lopez is going to be a judge? Why did Ellen leave? Anyone who has insight should really fill me in. I know why Simon left but why the others? Anyone? That's all I've got. Head on over to the Un Mom, read some more great posts, write your own, and link up. This post brought to you by PlayStation(R) Move. All opinions are 100% mine. With all this talk of wine and food there has to be moderation and exercise. I do love to eat. While I try to eat healthy, I do get cravings. I have found that giving in is better than eating everything else in the hope that the craving will go away. It never does. Thankfully, technology offers me the ability to exercise and burn the indulgent calories without ever leaving the house. PlayStation(R)MOVE, set to launch on September 17, is the latest arrival in the get-up-and-game movement. We have a Play Station, unfortunately the wrong one (PS2). The PlayStation MOVE will only be available with the PS3. If you already have one, you're in luck, you can add the MOVE bundle package for only $99. With several games already developed and more on the way, this is going to be a hot ticket item this holiday season. I'm into the workout videos so "Get Fit with Mel B" would be on my list of must haves. EyePet would be my first choice for the kids. With the ability to take care of, play games with and interact with their pet, this game would provide hours of entertainment for the whoe family. Once Hubster sees Socom4 available, I'm betting he'll cross the Lego kits off his Christmas wishlist and add a PS3 with MOVE. Anyone want to bet? PlayStation has incredible graphics and real life animation making it one of the leaders in the industry. Each year, grown men (and their kids) are waiting in anticipation to see what they will come out with next. We are no different. We are a family of gamers. PC, console and handhelds are always being used. We enjoy family game nights and love exploring new games together. Check out the Move site to see how far technology has come. I'll be here re-working my Christmas budget. We ate fabulously while on vacation. The food was so good, in fact, that I totally forgot to take pictures. I know. What kind of blogger am I who can;t even remember to take pics? I can tell you about it though. First night. We had made NC style BBQ and carried it with us. Something easy to heat up after driving and unpacking a weeks worth of supplies. It was very tasty and we had enough for people to snack on all week. Night Two. Fondue. We did it up right too. Cheese fondue with garlic ciabatta cubed, apple slices, carrots and broccoli. A traditional oil fondue to cook steak, chicken and shrimp accompanied by cocktail, ginger peanut, and sour cream horseradish sauces. We ended with peanut butter chocolate fondue and everything you can think of to dip in it. We bought the pound cake, strawberries and bananas and then raided the cabinets for the rest (pretzels, pears,vanilla wafers and pineapple.) This is the one picture I remembered to take. We poured the dip into the cups me brought for jello shots and enjoyed dessert out on the balcony. It was SOOO good. Night three. We ate at a little restaurant that mostly does burgers and sandwiches. I had the best Reuben I've ever had. The corned beef was tender and juicy with the perfect amount of 1000 Island and Swiss. It melted in my mouth. Night four. Taco night. This is where I concocted my Avocado and Shrimp Tacos and they were yummy. Night five. Definitely picture worthy. We had a table heaping with seafood. Steamed shrimp, crab legs, clams and mussels. We ate until thoroughly stuffed... and then ate some more. Day six. Date Night. We enjoyed adult beverages and a wonderful meal. I had a NY Strip with a loaded baked potato. I did remember to get a picture of the drinks though...Can you guess which is mine? Night seven, Leftover night. This is the night everyone is supposed to do their best to clan out the fridge so as not to have a bunch of opened containers to take home. FAIL. We did not do a very good job. I ate my leftovers from the night before. We barely put a dent on all the food in the fridge. While on vacation a couple weeks ago my son bought a Hexbug nano. Have you seen these? Cute little robot bugs that look like little centipedes. If the looked like spiders they wouldn't be so cute. They come in a variety of colors and have minds of their own. Tomorrow we are hosting a party for Hexbug. I'm looking forward to hosting and watching all the kids squirm with delight while building mazes and battle bridges to race their "bugs." But I feel like crap right now. Stricken with a nasty cold that has my nose stuffed and my tongue feeling like a strip of old leather. I've got my fingers crossed that it goes away before tomorrow so I can fully enjoy the party. It will happen regardless, 'cuz that's how I roll. I couldn't stand disappointing the kids when they have been so patient for this party to happen. Got any quick cold remedies? Send them. I can use all the help I can get. I was recently sent the entire Italian collection of wines being offered by Lost Vineyards of the World. They are a company that makes affordable wine available at rockin' prices due to their massive amounts of transports and the shipping deals this creates. I wrote already about Pink Lady and how fun and enjoyable it was. I now wanted to tell you about the rest of the bunch. See. I'm an old fashioned kind of gal. I like my Reds at room temperature. When I see things like "Best served chilled" I automatically think less of a red. It's mental on my part. I chilled this Lambrusco as directed and then sipped it one evening after everyone went to bed. Once I got past the mental thought that chilling takes away from the flavor profile...and after it warmed a little...this was an acceptable varietal. Not great, by my palate, it's definitely worth a try. Especially if you like your wines chilled. Suggested Pairings: Spicy food, barbecue and anything chocolate. A blend of Moscato and Malvasia, this sparkler was crisp and fruity without being too sweet. This could be used to celebrate a special occasion or just to add a little fun to your next gathering. Subtle enough for everyone to enjoy. It has won awards in such competitions as World Wine Value Championship (silver) and the Dallas Morning News 2010 Competition (silver). "This is one of our love-it-or-hate-it wines. At Lost Vineyards, we do not Americanize our wines to make European vinos taste like Californian wines. Our Argentine winery has a definite new-world style, while our Italian winery produces old-world styles. At public tastings, millennials lean toward new-world styles, while boomers tend to like the European wines. Sangiovese is the main grape varietal used in Chianti. Ours is a light to medium bodied, bone dry red. It is rustic, earthy, and high in acid. This makes it much more of a food wine than a quaffer. Try it with cheeses like parmesan, manchego, or gorgonzola. It pairs well with tomato sauces, especially sun-dried tomatoes." I find all that very insightful and would almost try it again with the suggested pairings just to see if my opinion changed. I'm not, by nature, a white wine drinker. I always enjoy trying new things but in general lean towards Reds when purchasing wine. That being said, this Bianco from Lost Vineyards was pleasantly crisp and moderately sweet. Not syrupy or overly done. I enjoyed this blend very much and with a price point under $10 ($5 if purchased by the case), would definitely purchase some more. Lost Vineyards refers to it as a "porch wine" (I'm so stealing that phrase) as it is light enough to enjoy without food. It also pairs well with mild seafood dishes like shrimp or scallops. I found this collection to be a lesson in all I don't know about wine. The whites definitely impressed me more than the reds and this is very uncommon for me. I like having a couple more whites to add to my minimal collection. ***Thank you to Lost Vineyards of the World for sharing this collection with me. While I was sent the wine to review I was not compensated in any other way and the opinions are 100% mine. What is the best approach to winning your fantasy football league? How many years has it been where you have fallen short of victory? Isn't it getting embarrassing? Don't you want to do something about it? If so, your first step will be to log-on to your hughesnet satellite internet. From there, find your league's home site. Go straight to the free agent list. This list should be available right after the draft - if you have a good league commissioner. Your job will be to go down the list using your satalite internet IL. That's right, you need to find out some information on every single player. To speed up the process, if you see someone as a 3rd string player on the depth chart, cross him off your list. It's the backups that you want to pay special attention to. Remember a few years ago when Larry Johnson was backing up Priest Holmes? In the middle of the season, Holmes lost his job to Johnson and Johnson ran all over the league. If you would have done your homework, you would have learned that they had been talking about this change in the Kansas City papers for weeks prior to it happening. If you would have made a trade for Johnson, you would have greatly increased your odds of winning the league. The key to success in fantasy football is finding the local news, not the national news that every other player knows.